I know I said I was about to take an LE 'holiday', but just before putting away my LE project box and getting my household ready for Christmas, I decided that I should tackle the hardest block and have that out of the way first. So what's the hardest block in Love Entwined? This swirling leaf. 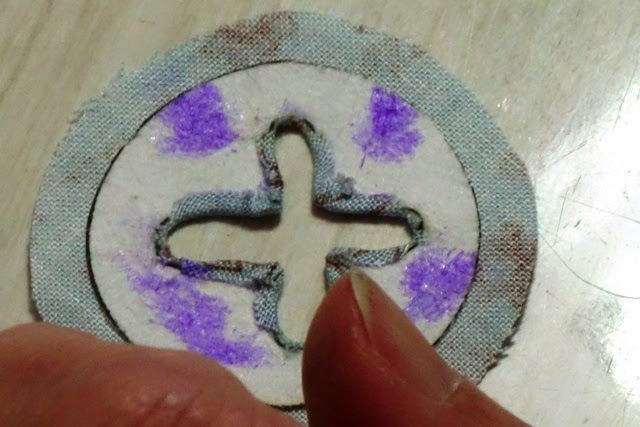 Of course, it's do-able but I have found it to be so small, fiddly and tricky! It requires perfect preparation, patience and a whole day of calm determination. 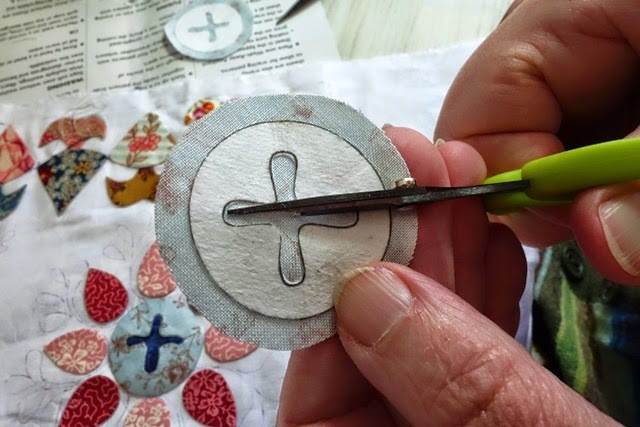 I have used my usual edge turn applique technique so there's nothing daunting about the how of these pieces - just the actual process, they're just so concentrated. 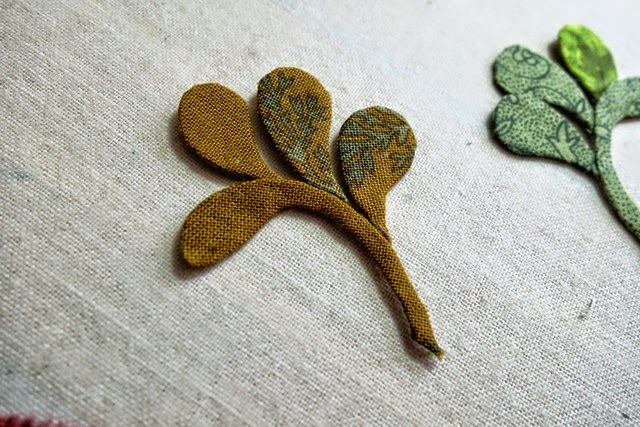 I'm working on another border today. 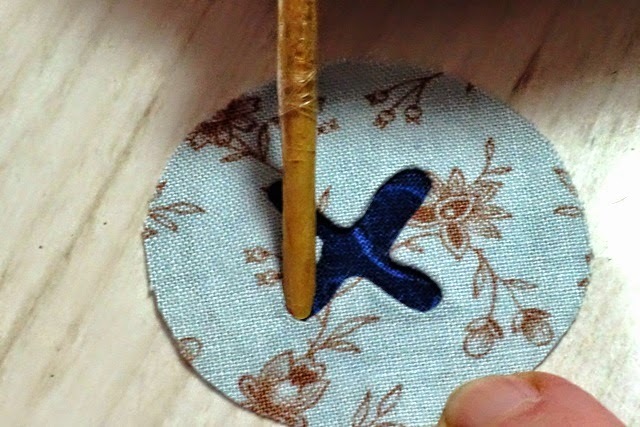 I'm making LE out of turn (according to the pattern); so pattern wise this would be Part 12. I just love these blocks and like all the blocks before and all the blocks to come, there is so much expression in the details. 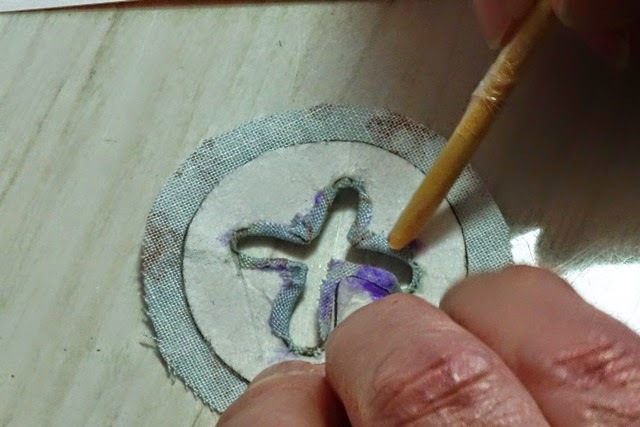 Today I'm focusing on the crosses which rest on a circle. Taking my cue from what I think are guardian angels 'guarding' these blocks, I assume they are crucifixes and that these blocks are an expression of spirituality or superstition of the maker. Of course, without some information regarding the life of the maker, we can only guess and those guardian angles might yet be candlesticks and these crosses just crosses... who knows? I think we all personalise and create narratives that appeal to us based on the visuals available. 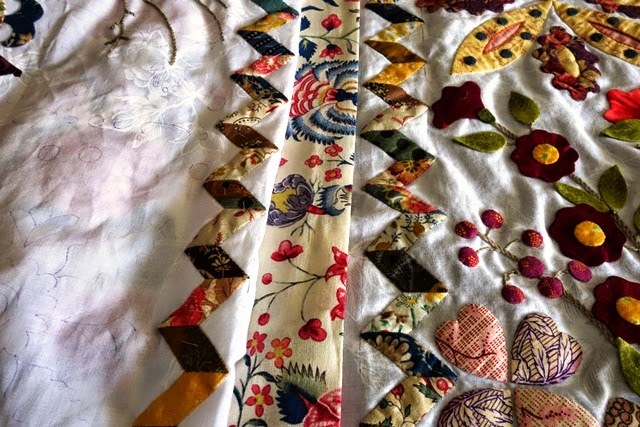 Certainly, within the Yahoo BOM Group, I have seen many different interpretations of these borders are each and every one express the maker, and that's all any of us can hope for anyway - for the quilt to end up expressing us whilst paying homage to another. It's a very special process. Before reaching this stage, I spent several days doing the prep work - yes, I'm talking prep again! 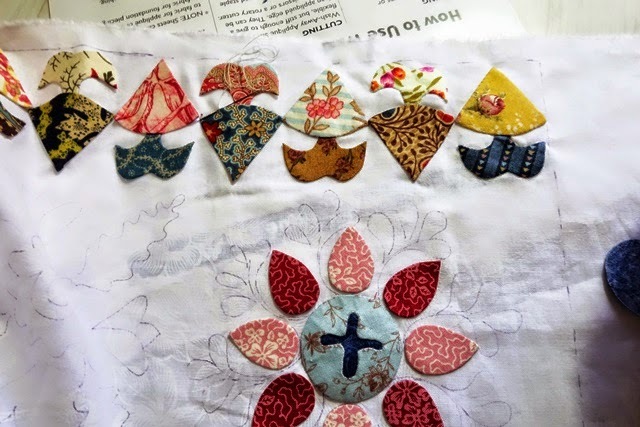 Printing out all the pieces, cutting out all the pieces, lining them up alongside the selected fabric - if I posted all these details you'd completely lose interest, its a fairly dull routine of organisation which I have shown in earlier LE posts. 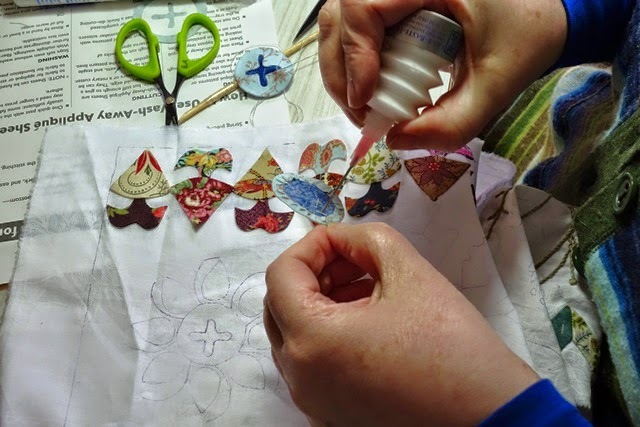 All I can say about the preparation required is that it's a good idea to somehow try to enjoy all the 'build up' work because it makes the piecing together work fall into place so beautifully. One needs the other. If you start from the scratch point with every block, you will soon lose the will the finish - its just to much to take on in one step. Break it down and make each step neat, precise and ready to move on with. 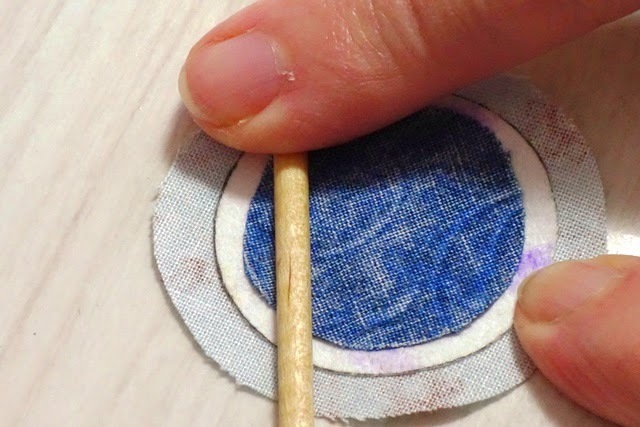 and now the the tips are folded over, you use the tip of your manicure stick to stamp down the remaining edges all the way around the shape. 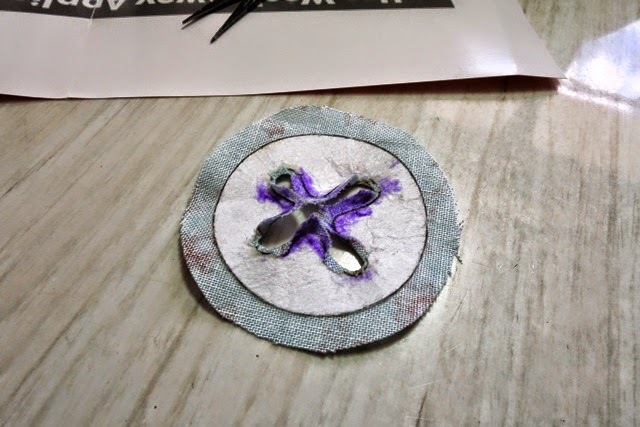 The reason I twirl before stamping is that if you try to stamp the 'Y' cut corner, it can tug or buckle, creating a tiny but annoying crease; using the give in the fabric grain to turn for you, makes your shape smooth and its much faster and easier to actually do than it is to blog about - so don't be put off by the length of this post, it will come together quicker in real life after a few attempts. 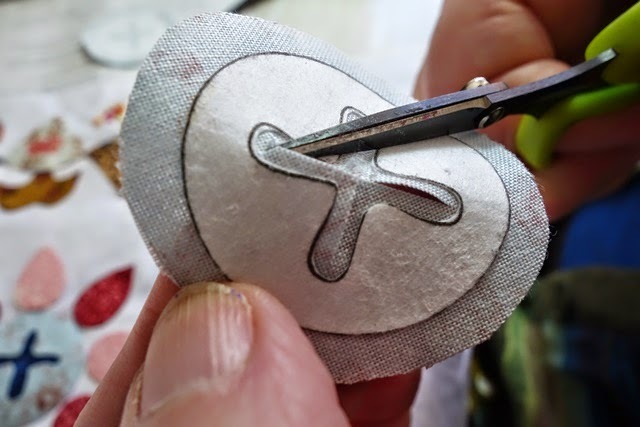 Now I turn it over and using my manicure stick tip, I press in at the corners to really fix it down and ensure that everything is smooth and no bunching is evident. 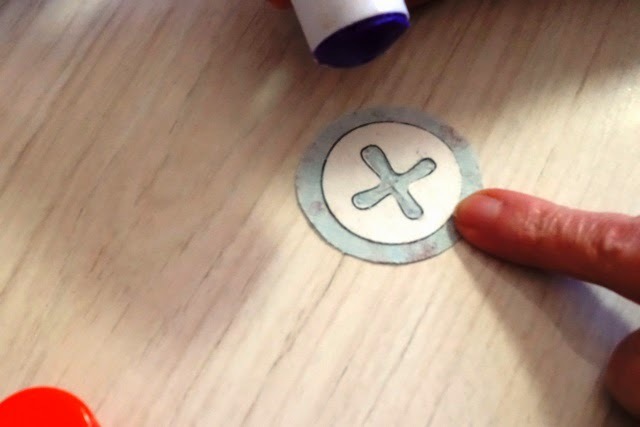 Now I will just mention that this shape is purposefully naive; it isn't supposed to be symmetrical or straight, it is supposed to look hand drawn like this. 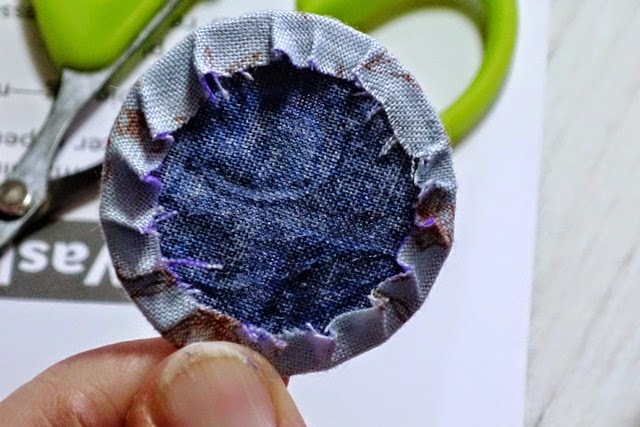 When I'm happy with the front, I add some more glue to the seam allowance and start tucking it in around the circle, like below. 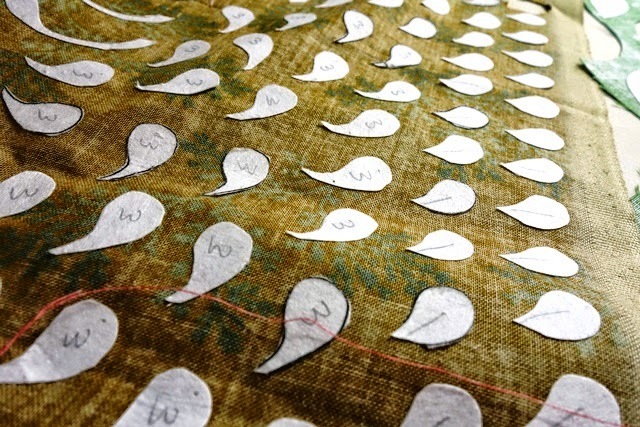 and now I'm ready to create the next piece and they will remain in position until I'm ready for a few gentle weeks of hand sewing them into permanent position. 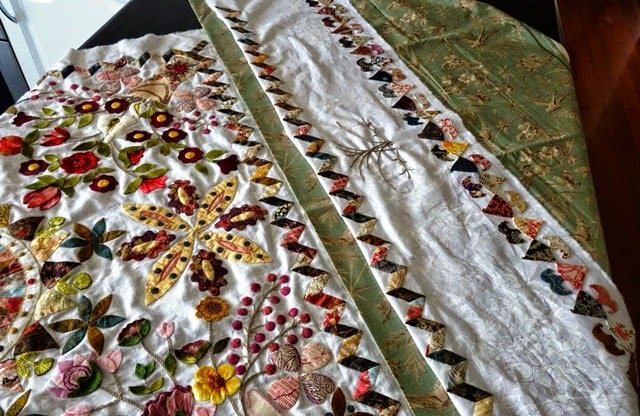 After this border is complete I will be taking a pause from LE for a few weeks and working on some other projects as I am finding it so intensive, I need a short break to pace myself. 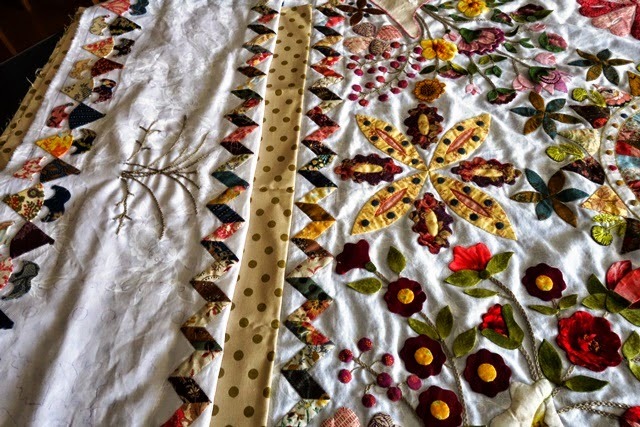 I know many people have had periods of stopping and starting and stopping again and in my opinion - this shouldn't be seen as a negative thing - this is a quilt like no other and only a very select few (and I am not included in that number) have the stamina to start and finish it in one swoop! 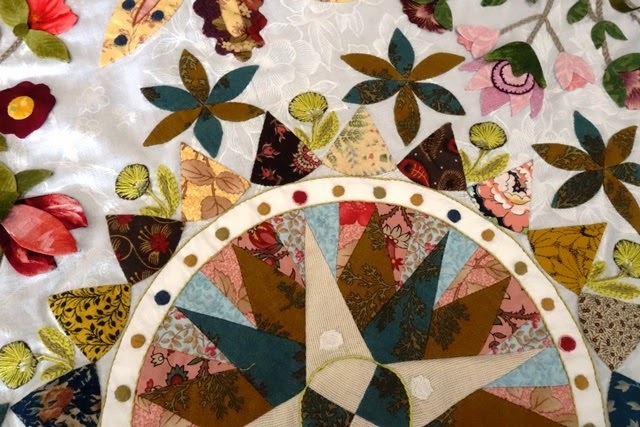 Narelle Birchall did and my goodness, am I in awe of her energy to have completed this quilt in time with the BOM release - it's a staggering feat! But for me, I need a LE holiday and I find that having just entered the birthday and holiday 'season' in my own household, my mind isn't focused on this as a priority (in terms of progress) for the next few weeks. I've finally started Lily Rose. What am I doing? Well, I'm full steam ahead with LE and I need a project to break up that intensity, and Lily Rose fits the bill perfectly as I want to hang it on a lonesome door in my house. I just love this wall hanging. 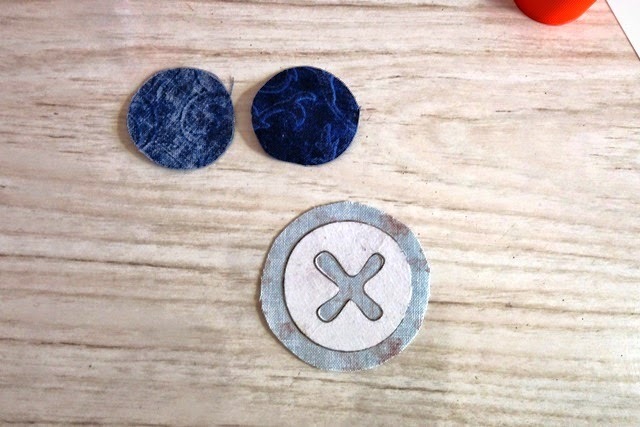 I'm so lucky - I get to see my patterns made even when I'm months away from making it myself! I feel like this about all my patterns. In the beginning, with my first ever BOM Red Delicious, I was making it along with the monthly pattern release. 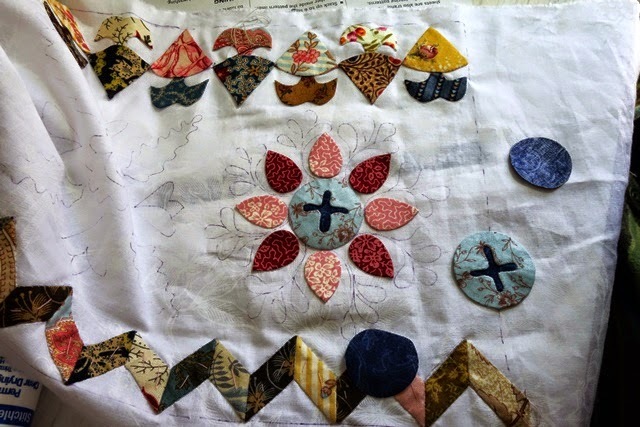 Since then, I have gone through bouts of intense quilt designing which means that I am potentially years behind on actually making some of my own quilts. And yet, this doesn't bother me any more. 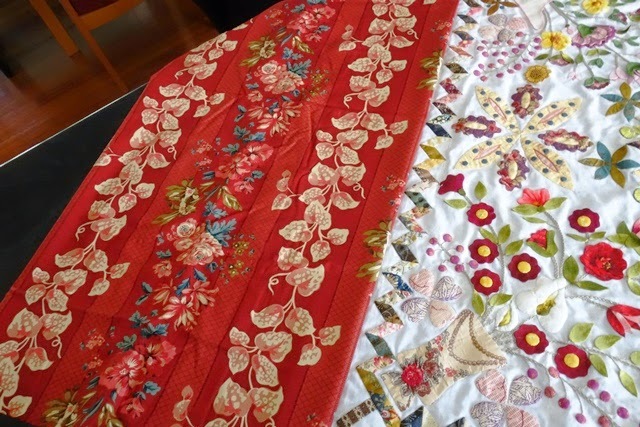 The more quilts I make, the more sure I am that its best to wait until you're in the right mood or time to make any quilt. I learnt this lesson with Love Entwined. I just wasn't ready to start when I felt that I should ....but then, when I finally did start, it was a real pleasure and just felt right. 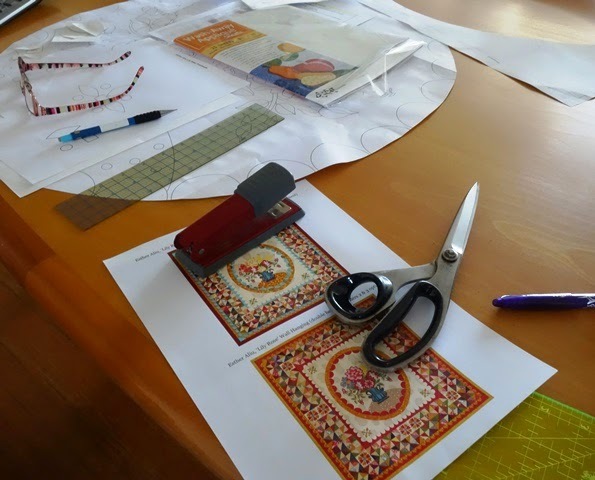 At the moment, I have three quilt designs in different stages of being turned into patterns. But in my spare time, I'm working on Lily Rose. I just feel like making it right now. 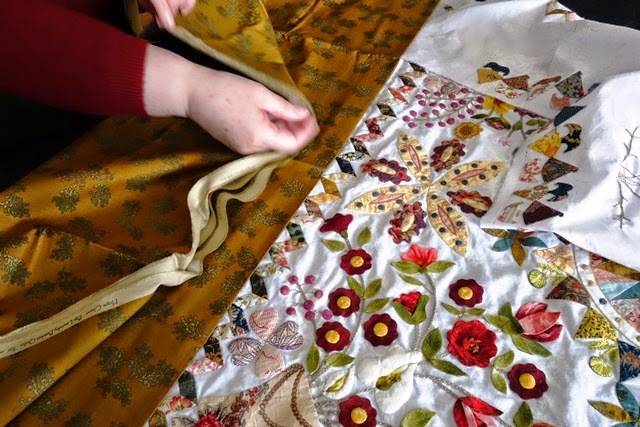 How do you decide which quilts you work on? Do you set them aside and select which ones you feel like making? Or do you feel called to make them as soon as you meet them? 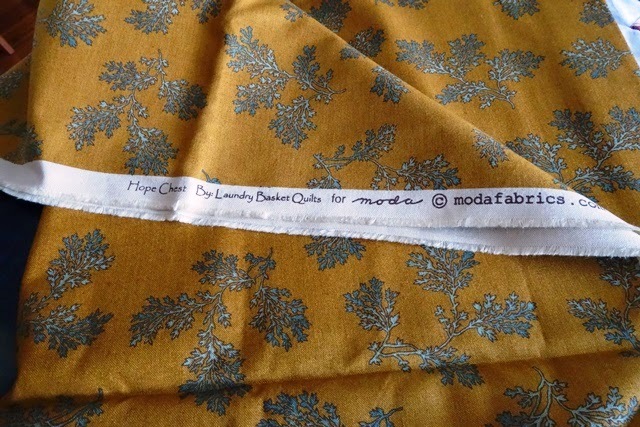 Thank you for commenting on my border fabrics post. I always love sharing what I do and its so nice to read other peoples opinions when you're busy working along at home. 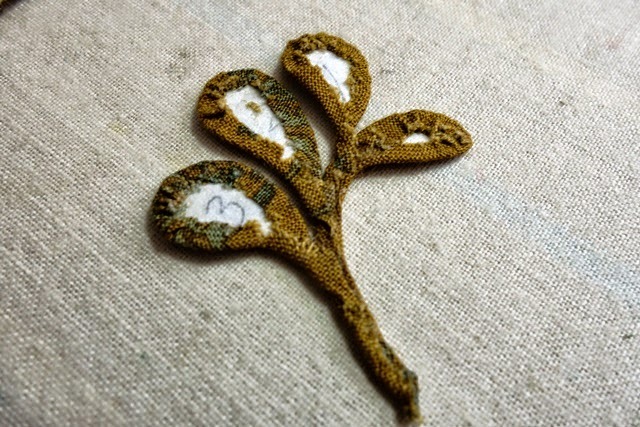 I changed my fabrics every day, pinning LE with the potential borders up on the wall each day. I loved them all, but this mustardy gold just kept shining through. Having the centre completed fills me with so much enthusiasm, I can hardly wait to move on now. 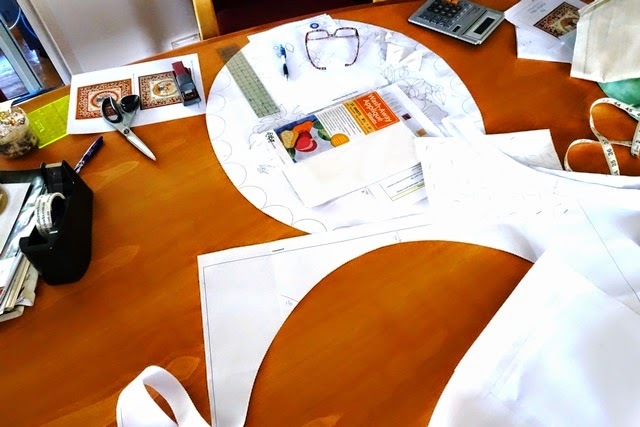 I have been working on bits and pieces of the pattern out of turn (according to the monthly pattern release) so once I have the border on, it's all going to feel 'nearly finished'. But you know me, another quilting day = another fabric dilemma. I have whittled it down to three most likely potentials with a few wild cards thrown in for good measure. Actually, I think they all work in their own way. 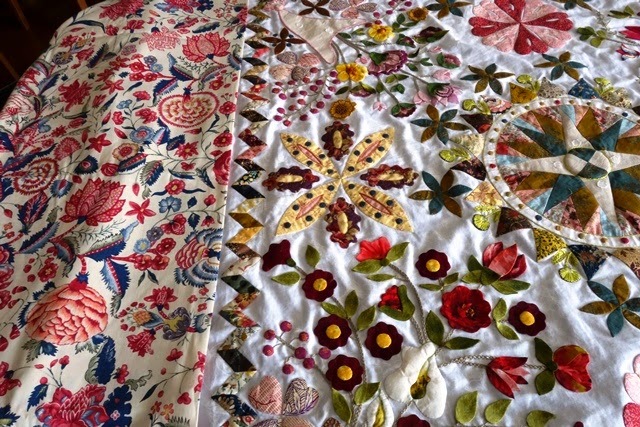 The challenge is staying sympathetic to the centre and the overall scrappy feel as each fabric pulls attention in and from different elements in its own way. This green looks more complimentary in real life than it appears in the pics and is definitely a smooth choice. It really blends. And it kind of grows on you as well. The more I see it, the more I like it. I've been really taken by the HopeChest range and this tone of red just settles right in with my scrappy style. 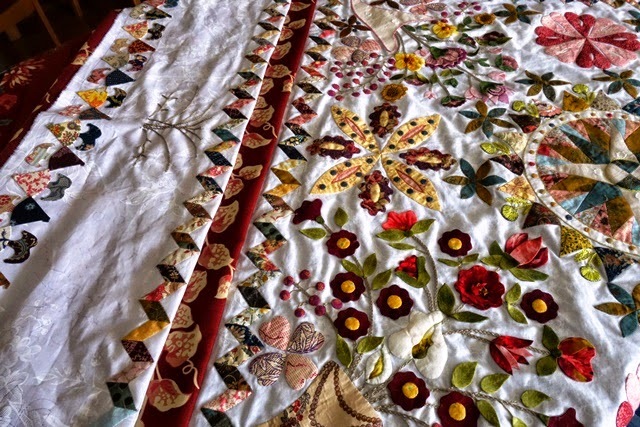 It does take the quilt in a different direction, but that isn't necessarily a bad thing. 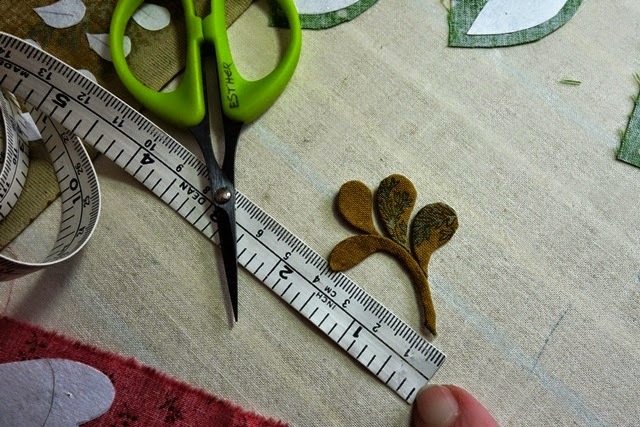 And I like that I can potentially fussy cut for the border too. It's lively...but maybe too lively and I'm not sure I want to take any attention away from the hundreds (thousands?) 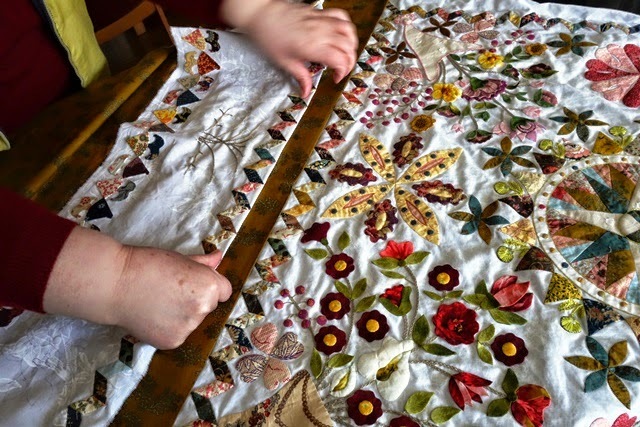 of hours of work on the applique of this quilt. And yet, I keep pulling it out as a potential. There's something about it which really appeals to me. Mind you, I am making another LE - in red and white, so maybe this is too much. yes, it's charming, isn't it? 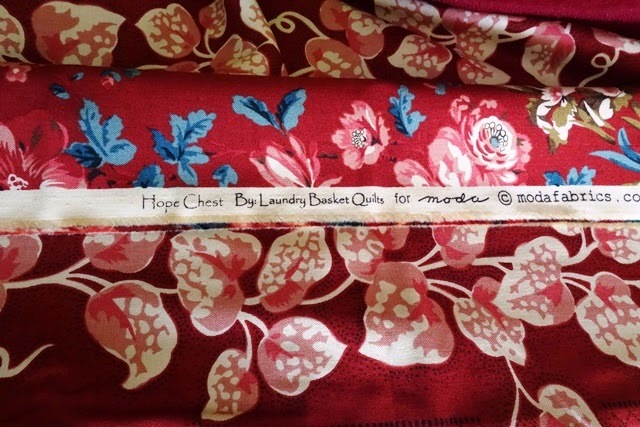 This is the leading fabric. 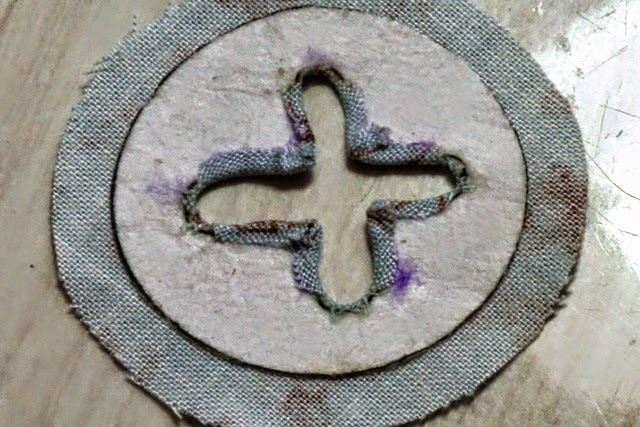 Having been used in the compass, it blends. And the mustardy gold keeps it decidedly scrappy and Georgian. I do keep returning to it. Nevertheless, I find myself wanting to experiment with other options to be really sure before I commit. 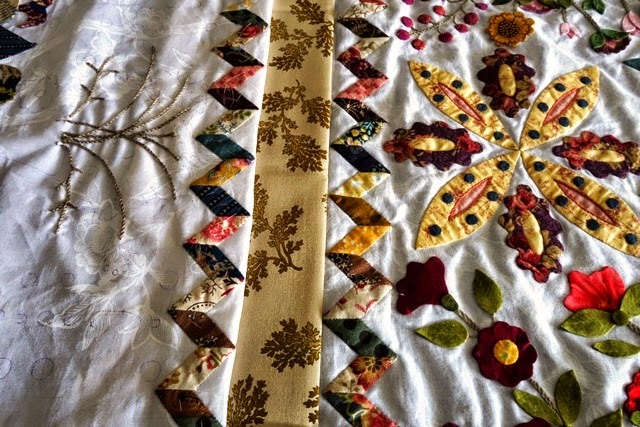 There's just too much at stake in this quilt to use the wrong border fabric. 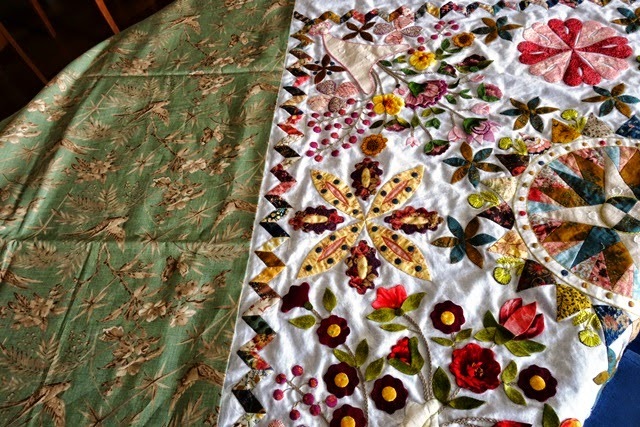 I wish I wasn't so indecisive when it comes to fabrics - I must admit that quilting fabrics and colours are my weakness. I'm not so undecided about anything else in my life. I really annoy myself with all this fabric auditioning sometimes. The problem is, I just see too much potential in everything! 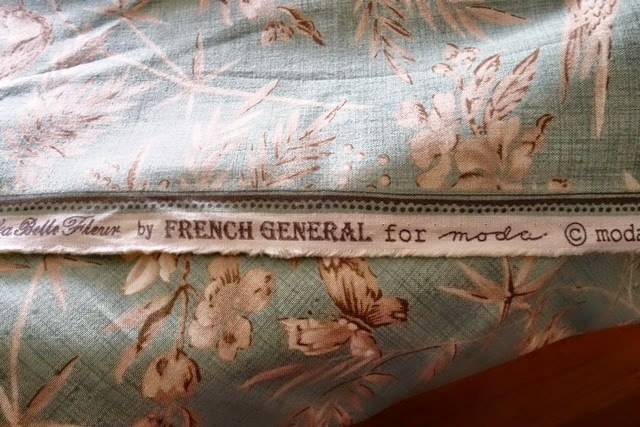 This fabric is from the same range, but a different colour. 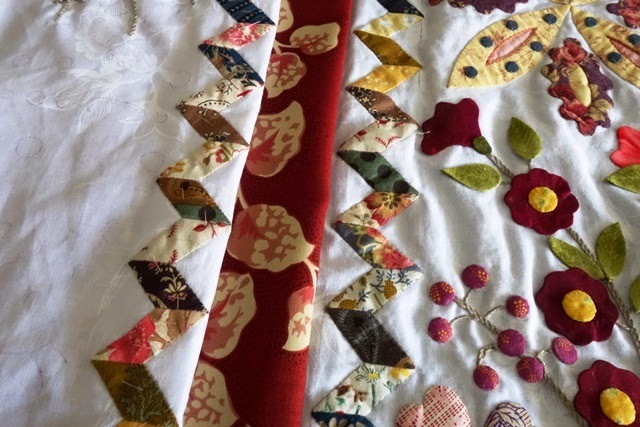 And I can't help myself, from day one, I have wanted to use polka dots somewhere significant on this quilt and yet they have never worked in my scrappy style. I think the problem is that I have such a soft spot for polka dots generally and am always trying to incorporate them into my quilts. I am going to design a polka dot BOM to get it out of my system - and use up all my polka dot stash at the same time. I've been thinking about this for a few years now and can never resist another spotty or polky fat quarter. I'm sure I can't be the only one?? Much too busy. Finally I can strike one option off the list. Even when it's an obvious 'no', I can't help but give the fabric every opportunity to shine! Isn't this pink toned beige gorgeous? I love this antique style print. 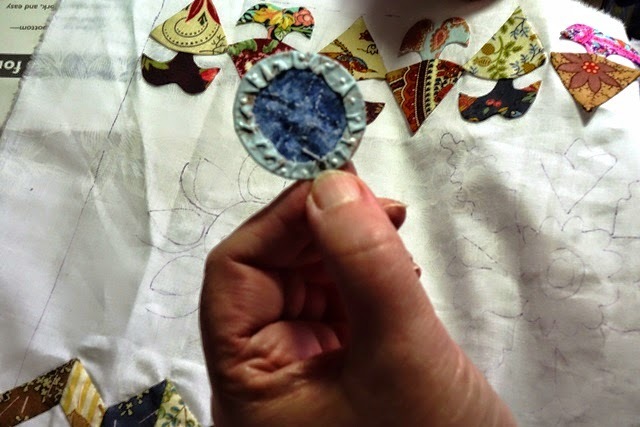 Although, seeing it now in a picture makes me realise that it's better suited to another quilt project. Maybe something more like Lily Rose. I've narrowed it down between my mustardy gold, the light green and red. 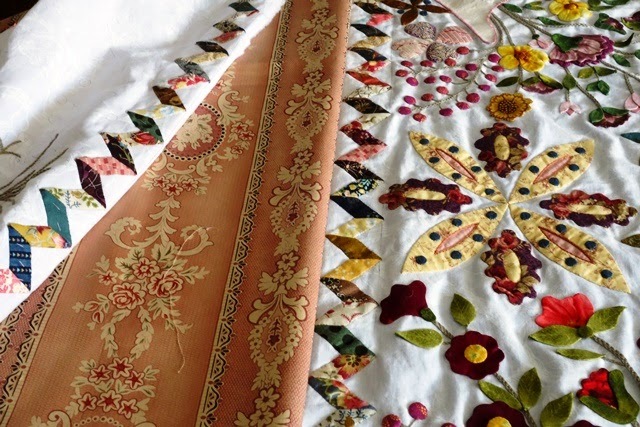 I will put LE up on my Design Wall, pinning the border fabrics in position and wait to see which looks best throughout the next three days when I'm not so intently thinking about it. I didn't expect so many well wishes yesterday for my birthday - thank you everyone who stopped by and took the time to comment, it really made my day! I always think chocolates are the prettiest things. I'm looking at these today, because I actually received them on my last birthday, over 12 months ago! I don't really eat chocolate so much as admire it (and I have no idea who enjoyed that missing one?) you can see from the bloom on the center round chocolate that these are now a bit old and stale. But still so pretty. Why am I showing you these lovely old chocolates? Because they actually inspired a WIP of mine that I'm finally getting around to pattern drafting for release. The design is a sweet cakes sketch, but the inspiration was all chocolate. I'll let you know how I get on and hopefully have these sweet jars filled with delights and released over in the group very soon. It's my birthday today and as you can see, the festivities have already begun! I'm more of a savoury person than a sweet person, so although this is a lovely start, I have to admit that I'm more looking forward to a family lunch. As for that, I have no idea what we're having. My DD is in charge and I am blissfully unawares (except for the clattering coming from the kitchen). Birthdays are like our very own New Year's and my own birthday is always a time when I think about the year that was and the year to come. This year I'm thinking about how busy I've been - it's been an extraordinary year and I have spent every single day (apart from days off for the flu) working at 'something' full time. It never seems to end. As soon as I nearly finish one thing, another starts up. I always thought that getting older would somehow coincide with a a slowing down, but I don't feel this to be the case in my own life. As a matter of fact, I even get up earlier in the mornings than I used to - which defies explanation! I also want to thank members of my Yahoo BOM Group. It looks so easy to leave a comment or upload a photo but anyone who blogs knows that these things take time - and I appreciate the time members take to be involved in the group. There's always photos and messages of support making the rounds as well as a kind word or helpful suggestion. Its such a nice place to be - and those things don't happen by accident. Thank you for being a part of it. I'd also like to thank the Moderator's in the Group. 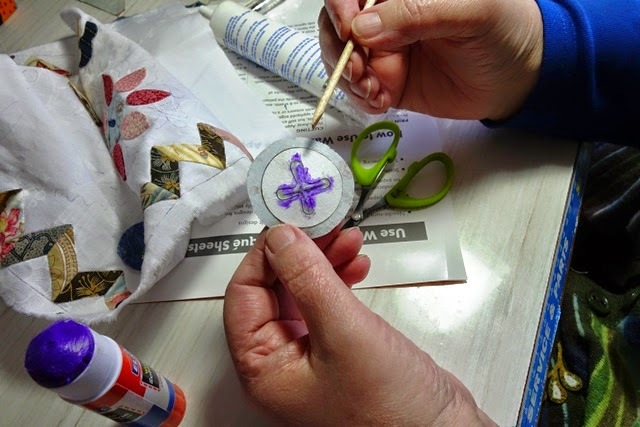 They are all wonderful quilters with busy lives and projects on the go, but they volunteer their time to keep things running smoothly. It's a mostly thankless task and I think it's incredible that they are so generous with their time. 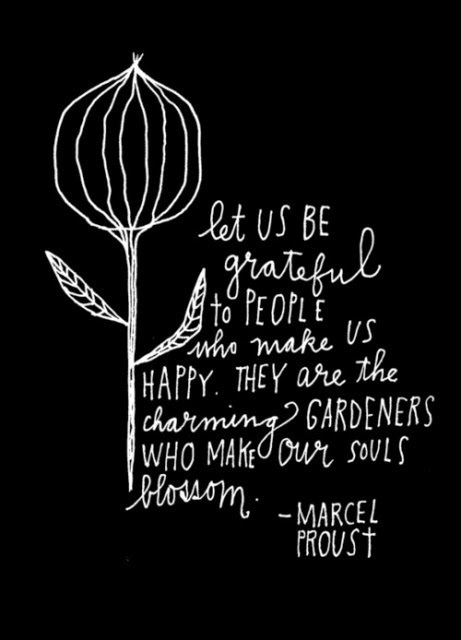 Anna Marieke, Glenda, Bunny, Pat and Jane - you have all been and are such a wonderful and supportive part of me being able to release my BOMs and I am deeply grateful for and to each of you for the time you have been and are being available in this role- you are the backbone of the Group. Without you and the hours you selflessly give to all of us, and have given to us for periods of time, I simply wouldn't be able to share and distribute my BOMs. Thank you so much for all that you do and have done. Life is a precious and temporary gift. We have such a short time given to us that I always feel we should take every opportunity to share what we can, when we can, just because we can. Just yesterday I was talking to my DDs about what it means to be blessed. I have always tried my best to teach my DDs that if you are blessed in something, you should do all you can to share that blessing. 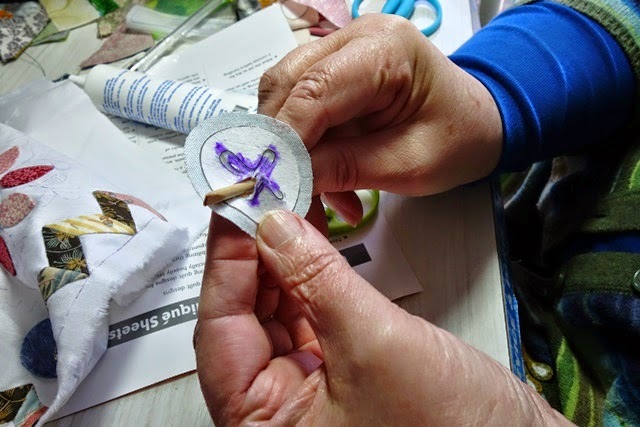 We all have skills which come somewhat naturally for us and I am lucky in that I have found a way in my own life to do something that I enjoy and can accomplish. 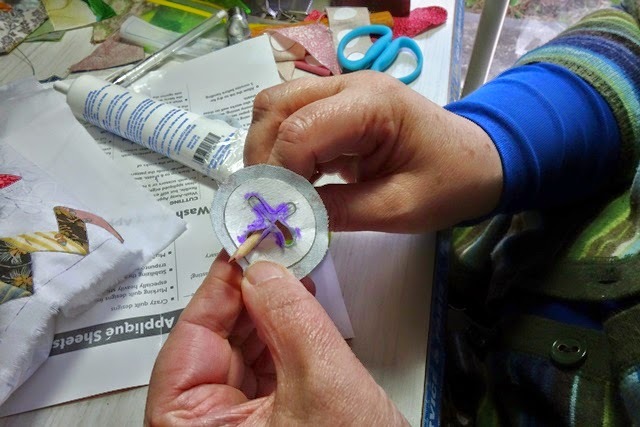 There are plenty of things I'm not so good at - but which I still try and enjoy- and in those things I'm always grateful to the people who extend themselves enough to share their skills and what they know so that I can learn a little too. This blog is a part of my life and the people who read it are a part of what I do too; so today I'd like to thank you all for being part of my birthday and for making this blog and my Yahoo BOM Group such friendly and supportive online places to be. It's wonderful. This is one of my favourite cakes. I don't make it very often, but in the last few years I have made it on November 1st, maybe because it's such a contemplative recipe. It's you, a bowl of apples and a couple of hours in the kitchen. But don't worry, it's worth the effort. Today I'm making two cakes as I'm giving one away. 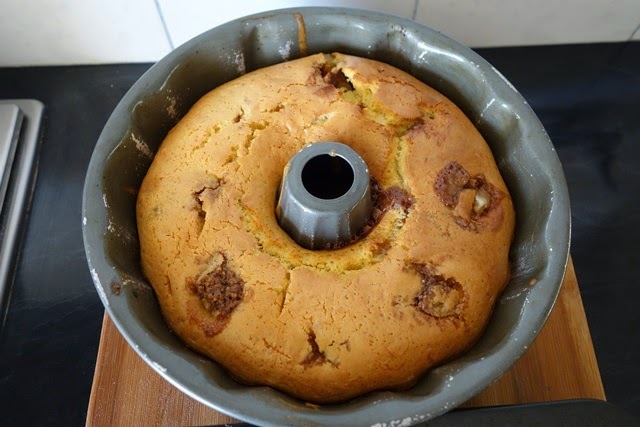 I think the best cake tin for this cake is a plain round one, but mine has gone missing. 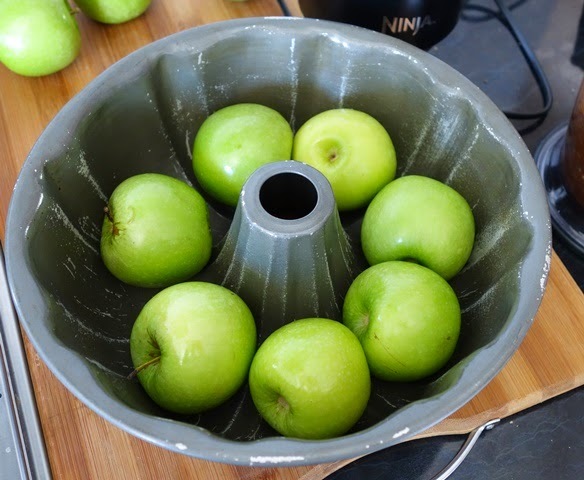 So I'm relying on an old bundt (which also works beautifully, but do use small apples or they will stick to the inner core of the tin). It takes time but it actually quite easy to make. Granny Smith apples work best for this recipe. Other apples fall apart. Core your apples. Your apple size will depend on the size of your tin. Because I am using a bundt tin, I have opted for the smallest apples I could find and they really are little. 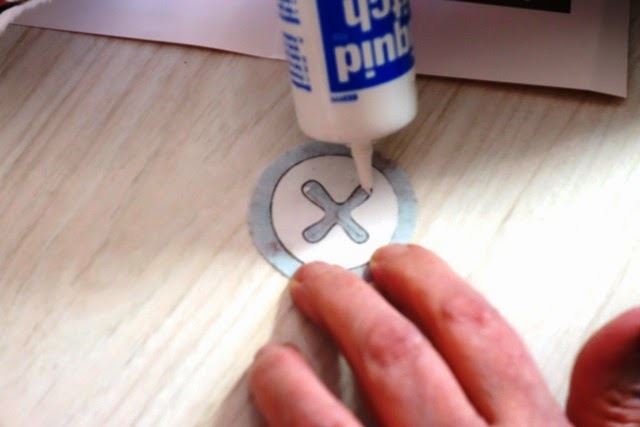 This makes coring them a little difficult, so take your time. You want a nice, neat cored out shape. And if you can, try to make the bottom hole of the apple as small an exit as possible. 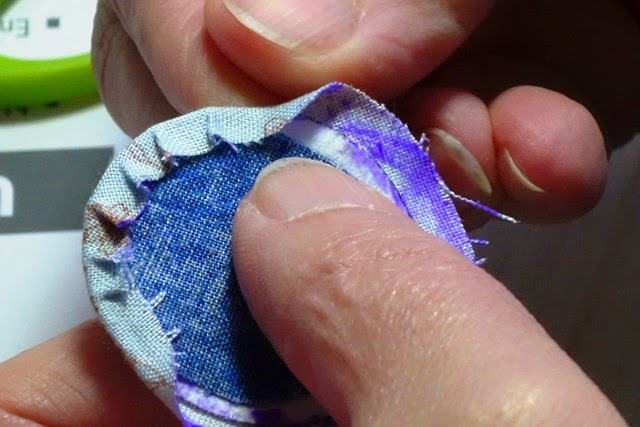 Flesh out the middle, but keep the bottom smaller. Now, I don't now about you, but I can't find an apple core-ing tool for love or money! I have been through 3x in the last 12 months alone. 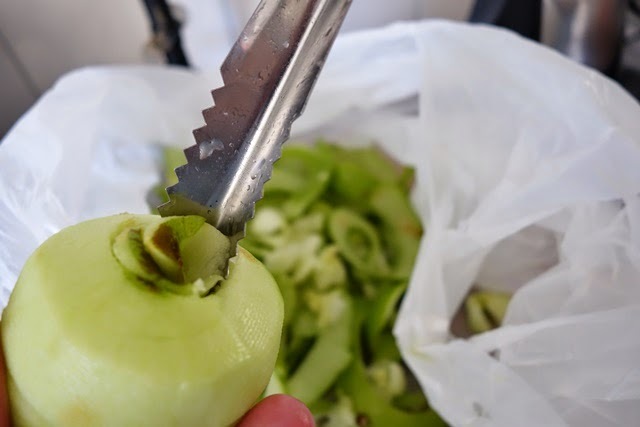 The handles just completely separate from the metal corer and it's a real nuisance (it also always happens when the tool is stick in the apple so you have to cut it out too). 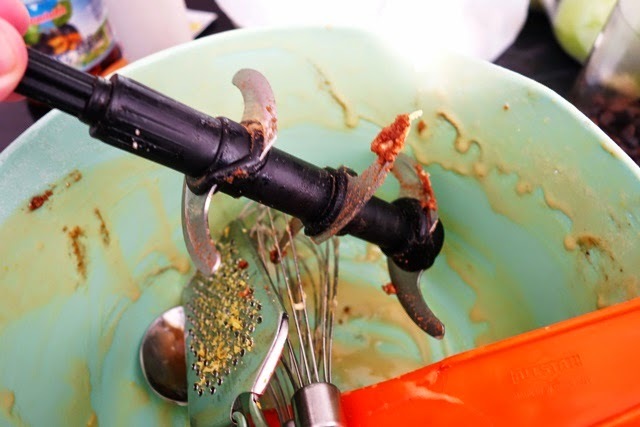 I'd really love to find an apple corer that works, so if you know of one, please let me know. This tool I'm using here - I don't even know what it is.I found it in our cutlery drawer and it nicked all my fingers which reminds me that I need to find one. In a pan, add your cored apples and gently stew/steam them for about 10-15 minutes in about a cup of water and fresh lemon juice. 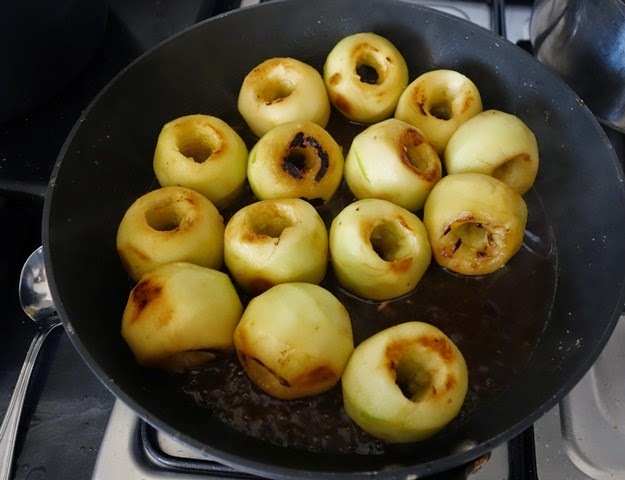 It's really important that you don't over stew the apples or use too much liquid, you want to lightly brown and soften them, without them going to mush. This is the hardest part and requires patience and care. They should be just starting to tender but firm enough to stuff without falling apart. 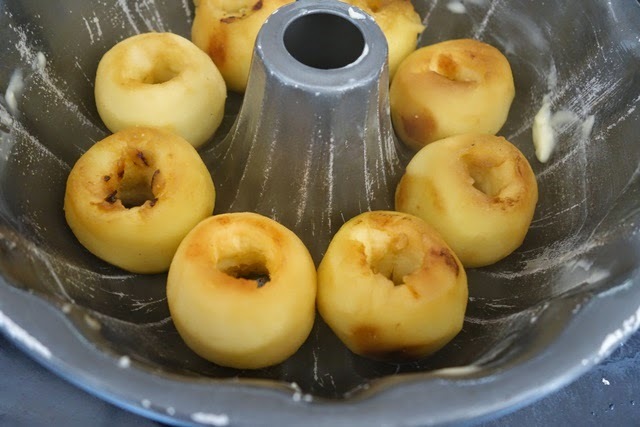 Whilst your apples are softening, make the apple filling. Now, there is no recipe for this. You make it according to taste. 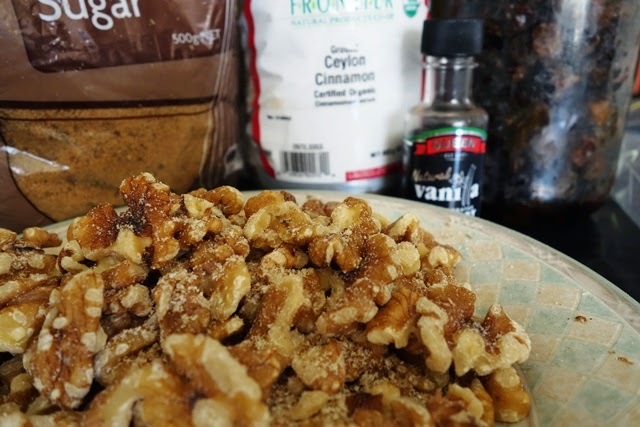 Simply mix walnuts (any nuts will do), vanilla extract, lemon zest, cinnamon and sugar to taste. I use brown sugar and I use very little because I don't have a taste for sugary things. Just mix it all together until it makes a delicious firm filling. I usually add just enough butter to make all the ingredients combine. I mix mine up in my Ninja. Everyone always wants to know how I like my new Ninja. Well, it's fine. I'm trying to downsize my kitchen and the Ninja was a good choice for me. I do like it and it's useful in many ways, but I will just warn you that the blades are lethal. Everyone who touches it somehow seems to cut themselves and I've done that myself a few times too. Wash it straight away because the blades are difficult to clean. This seems so obvious, but I've never had a kitchen tool inure so many adults before. I think it works great, but I wouldn't have it in a household with a child or teenager. It's just too sharp. 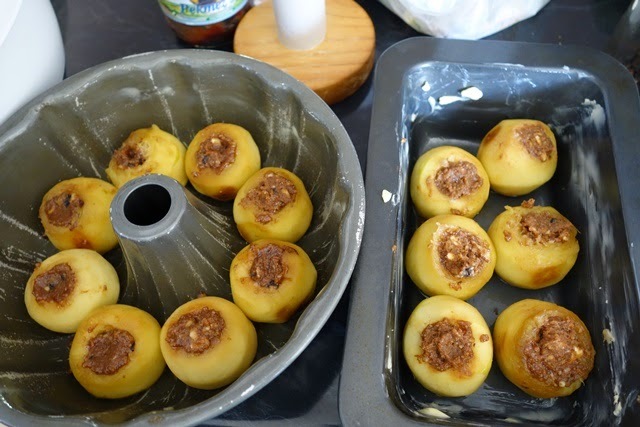 Butter the cake tin and stuff your softened apples with the nut fulling carefully, keeping apples intact. Make the cake batter and pour over the apples, about 3/4 high in the tin, just covering the apples as the cake batter will rise a little. 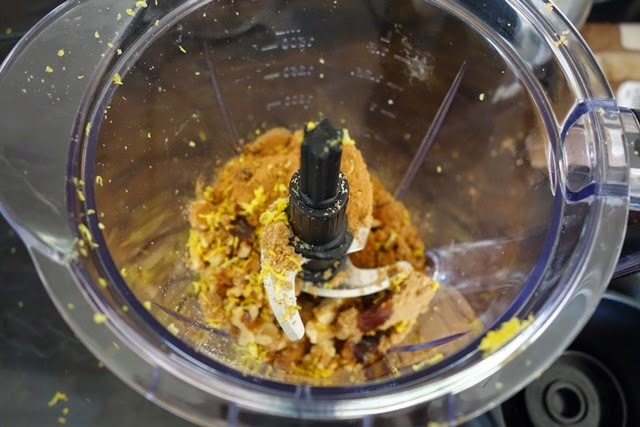 Stuffing: nuts (about a cup), vanilla, zest of 1 lemon, vanilla, sugar, cinnamon and butter to taste. Mix all ingredients together into a firm paste. Cake mixture: (my DD used packet cake mix with this recipe when she ran out of ingredients, and it was delicious, so don't be afraid to experiment. Any good cake base mixture will do.) The real work is in the apples. Place the butter, caster sugar, eggs, vanilla, flour and baking powder into a large bowl and mix well until smooth. Bake for 35-45 mins (depending on oven) until golden and springy to the touch. 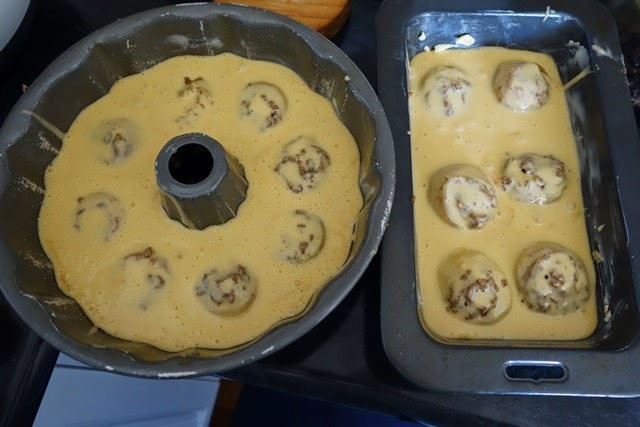 Leave to cool for 10 mins, then turn out of tin. Cut into slices. 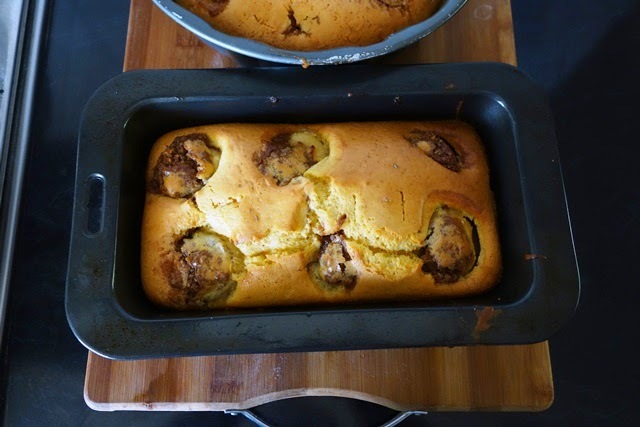 I don't feature many recipes on this blog, simply because I don't bake all that much. 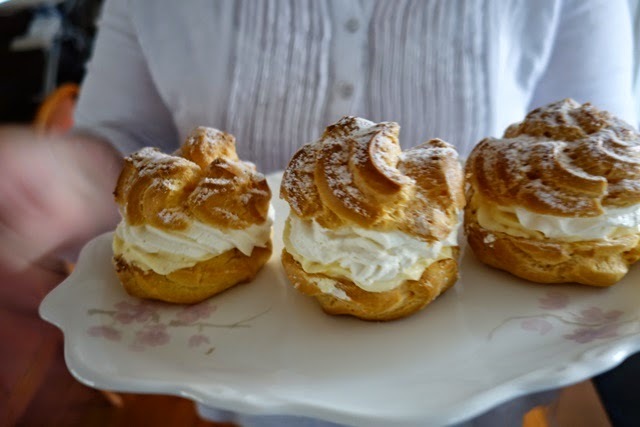 However if you are interested in what I call 'old fashioned' recipes like this, you might like to visit the Mennonite Girls Can Cook Blog. I love it over there. And don't let my definition of 'traditional' put you off. When I say traditional, I mean honest ingredients and real cooking. Mind you, they have a lot of easily prepared dishes too and when I'm stuck for dinner ideas, I like to pop in and inspire myself. They cook the way I eat so it's easy for me to 'find something for dinner.' And I'm so grateful that they're there because when my DDs can't find my 'old family recipe book' they just check out the Mennonite blog, they always find what they're looking for.